It’s amazing how many types of golf courses there are. When people ask to name my favorite, I always demur, muttering, “It depends on where you’re at.” There are simply too many favorites. In the Pacific Northwest alone, nearly every major climate/geographic zone and type of course is represented. You’ll find golf played alongside a major ocean (the Pacific), mountains, major rivers, riparian areas, meadowlands, farmlands, bone-dry deserts, rain forests, sprawling estuaries, and high spots offering vistas stretching 100 miles and farther. There’s a reason why the term “Big Sky Country” was coined in this neck of the woods. The weather in the nation’s upper-left-hand corner encompasses very cold winters and magnificent summers; frigid winters and steamy summers; “banana belts” that receive only 12 inches of rain a year while nearby areas get 40; and climates influenced by mountain ranges and fresh- and salt-water bodies. Growing seasons stretch from 150 to 260 days. Golf courses are situated at sea level and elevations as high as 5,000 feet. Of the estimated 800 golf courses I’ve played and/or visited around the globe, over 500 were in the Pacific Northwest (Washington, Oregon, Idaho and Montana). I’ve also been lucky to have golfed in places as diverse as the Canary Islands, Mexico, Louisiana, Mississippi, Massachusetts, California, England, Ireland, Hawaii, New Zealand, Australia/Tasmania, Hawaii, North Dakota, Vancouver Island, South Carolina, Illinois, New Hampshire, Maine, New Jersey, Scotland, Antigua, New York, Texas, Germany, Washington D.C., Maryland, Virginia, British Columbia and Wyoming. I’ve seen some amazing designs, some that required moving hundreds of thousands of cubic yards of dirt to fulfill the architect’s vision. The most extreme case was a single par-3 at Tom Fazio’s Querencia in Cabo San Lucas that reportedly involved 750,000 yards! Yet others needed minimal earth-moving; for example, the magnificent original course at Bandon Dunes Golf Resort took around 10,000 yards. There was the former Clover Valley Country Club near Port Orchard, on Washington’s Kitsap Peninsula. The original nine at the then-semiprivate club was built in 1962. Another nine holes were added a decade later. Changes were made over the ensuing years, the oddest of which was switching the poplar-lined fairways a baffling 90 degrees. Nothing like standing on a tee, seeing a blurry green in the distance behind dense foliage, and firing a golf ball through a wall of trees that never should be planted on a golf course in the first place! Sadly, I came to personally experience Clover Valley’s watery nature. While crossing a rickety bridge over Salmonberry Creek, my trusty Canon – presumably secure in the cart’s cubbyhole – bounced out and plopped into the drink. Clover Valley cost me $250 to repair that camera. My biggest regret is that photographic proof of the poplar-blocking fairways was washed away. In 2003, a fellow named Won Yang purchased the 100-acre property and, thankfully, converted these 18 holes into Yang’s Botanical Gardens. A week later, I found that Rudy had removed every fir, pine or cedar on the site and sold the timber. On the “signature” hole, he placed an irrigation pond that spewed 105-degree water from the naturally-heated springs. Though it was purportedly cooled to 60 degrees before application, the mineral-rich water made the turf hard, wiry and just plain weird. The pond was situated at the corner of what the scorecard indicated was a 400-yard, dogleg-left par-4, rated the course’s toughest hole. When I reached the tee, I took a look at a wide fairway curling around the water, then glimpsed the green off to the left across the hazard. This 10-handicapper pulled out a 5-wood, hit my drive onto the green, and two-putted for an easy birdie. Just like at Augusta National. Two courses’ claims to fame were for having the shortest par-4s in the Northwest (and hopefully nowhere else). One was Golf City in Corvallis, Ore., home of Oregon State University’s vaunted turfgrass program, and the other was Wayne Golf Course in Bothell north of Seattle. Golf City had a less-than-brawny 85-yarder. An “albatross” was possible by scorching a worm-burner under low-hanging branches (a putter in the summer?). Wayne’s shorty – on a back nine since converted into a natural area (see Yang’s Botanical Gardens above) – was maybe 120 yards. It doglegged 90 degrees to the right around a Cyclone fence to a green on a bluff. Two choked-up sand wedges did the trick on this brute. Perhaps some courses should never have been built due to their less-than-ideal locations. At last check, the Northwest boasted three courses named “Riverside,” and each has a history of flooding. (“Jeopardy” answer: Riverside is most common name for an American golf course.) The clubhouse at the Riverside in Kelso, Wash., had to be put on three-foot-high blocks; it’s interior walls still show waterlines from past deluges. 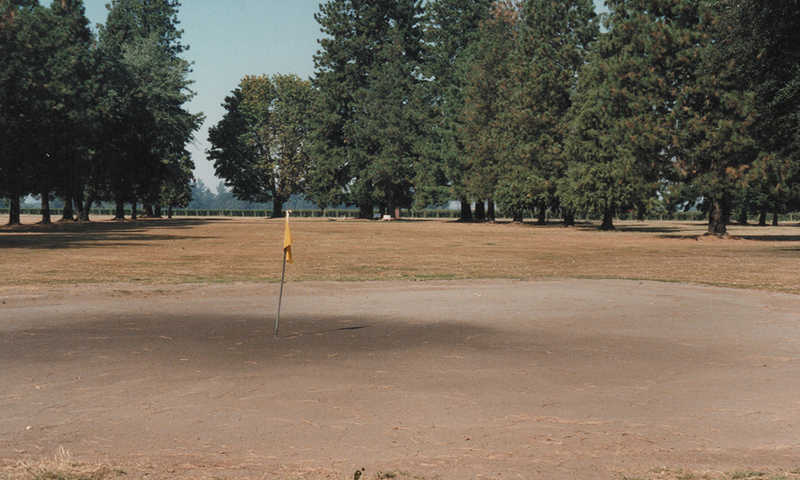 An 18-holer east of Seattle, Carnation Golf Course, lies on the Snoqualmie River floodplain. In 1990, a raging torrent carried a bridge on its second hole all the way to the city of Everett, 15 miles downstream. Other courses have successfully coped with unusual sites. At one time there were two Northwest layouts within horse-racing tracks. Despite its popularity, Portland Meadows was closed years ago. But historic Touchet Valley – established in 1925 – in Dayton, Wash., is still going strong. Signs warning golfers to look both ways for galloping horses precede Touchet (pronounced “Too-shee”) Valley’s two infield holes, an area that once housed the high school football field. These side-by-side, mirror-image par-4s head through the center of Columbia County’s largest stadium to greens butting against the track’s inside railings. Other venues have employed local “resources” to outfit their golf courses. At Kellogg Country Club in Idaho, blackish copper tailings from nearby mines are used as bunker sand, a material also employed at the much more acclaimed Jack Nicklaus-designed Old Works course in Anaconda, Mont. Aspen Lakes Golf Course in Sisters, Ore., was developed by the Cyrus family, owners of Sisters Aggregate and Construction. Their road-building company filled the course’s surprisingly facile traps with crushed basalt, rendering these Bill Overdorf-designed hazards bright red in color. And the Robert Muir Graves-designed Three Rivers in Kelso was built atop millions of tons of ash and mud dredged from the nearby Cowlitz River following the eruption of Mount St. Helens on May 18, 1980. Note to Readers: So what wacky golf course designs have you seen? Please send them to jeffs@cybergolf.com and I’ll use them in a future installment of “Making the Rounds.” Be sure to include your full name, phone number, email address, job title, place of business and, if available, a high-res (and copyright-free) jpg photo. Thanks – this could be fun!